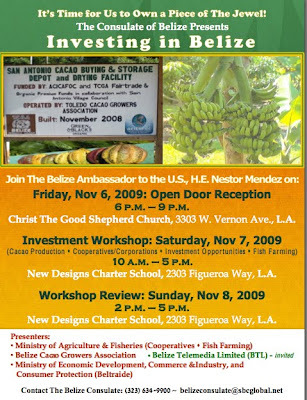 The Consulate, with the full involvement of a task force has coordinated an “Investing in Belize Conference” scheduled for Saturday, November 7th and 8th with an open door reception on the evening of the 6th. The primary intent of our conference is to enter into a public dialog for us, particularly Belizeans living abroad, to have a sense as to the many investment opportunities available in Belize. We want you to listen and ask questions.